Nappy Cakes, Clothing Bouquets, Organic Cotton Clothing Sets, Teddy Bears, Balloons, Chocolates. 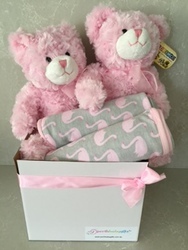 This unique and practical nappy hamper is delivered gift wrapped and contains: Soft Pink Bears x 2, Interlock Baby Wrap x 2, Huggies Newborn Disposable Nappies x 12. NB: Soft toys and contents may vary, subject to availability.